This incident of a false missile alarm in the Hawaiian islands was a surprise for all of us. Yet at the same time, this ordeal represented yet another mystery for us to solve, and these efforts can assist us in achieving greater levels of understanding. 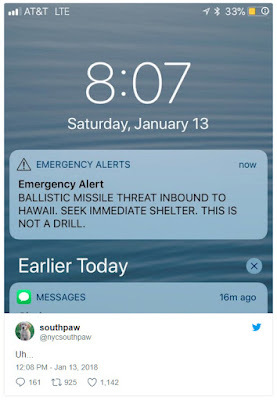 The issue of the Hawaiian missile sent hundreds of people into a short panic. This onset of panic was then replaced by relief, frustration, and possibly confusion as to why the missile threat/false alarm was allowed to take place to begin with. 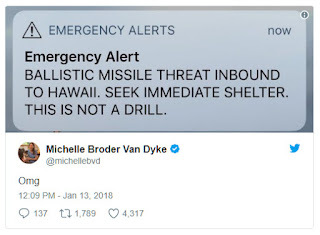 Some theorized that the missile warning had to be sounded in order for the Alliance to gain access to vital data located in Hawaiian databases. This data was thought to be locked away in secure locations in Hawaii, but in the event of a real missile threat, this data would be sent to the U.S. mainland—possibly in or near Washington, D.C. If this mainland location was the Pentagon, this might explain why President Trump made a visit to the Pentagon on January 18 for a high-priority meeting. The meeting involved matters of high security, according to sources, and was reported to involved the possible impacts of the government shutdown which took place days after. However, according to various theories, this meeting might have also covered the recent missile false alarm in Hawaii. Other theories from around the net involve the false missile alarm actually being a real threat which was averted either by military or by black ops, Secret Space Program defense forces. These theories also suggest that the missile may have even been shot down by ET spacecraft which have been reported by numerous whistleblowers in past years. According to these whistleblowers, in the past, UFOs had a way of shutting down nuclear weapons facilities in multiple countries whenever nuclear war was of significant threat. There are many theories and testimonies to evaluate. 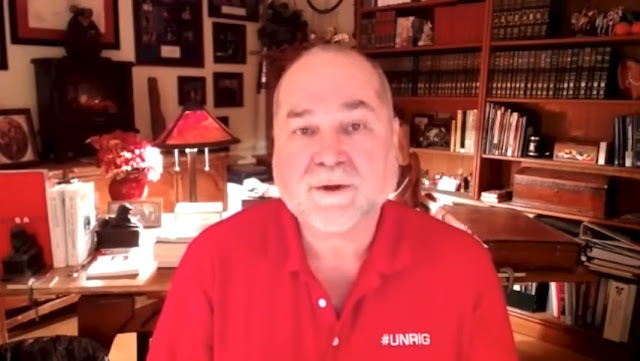 For another notable perspective, here is retired CIA and Marine, Robert David Steele. As stated on numerous occasions, we live in interesting times. It is difficult to say with certainty what the truth of the current situation is. To gain further perspective on the situation, here is one of the many news reports that came forward just minutes after the alarm/false alarm was sounded. This is Vox.com. While it was a false alarm, the episode raises some interesting questions. 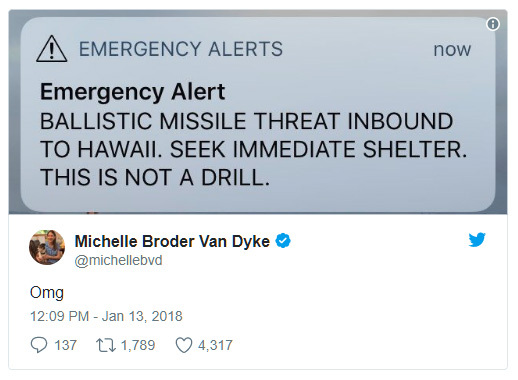 Panic ensued for a few brief moments on Saturday after a false emergency alert notice was issued of an impending missile threat to Hawaii. 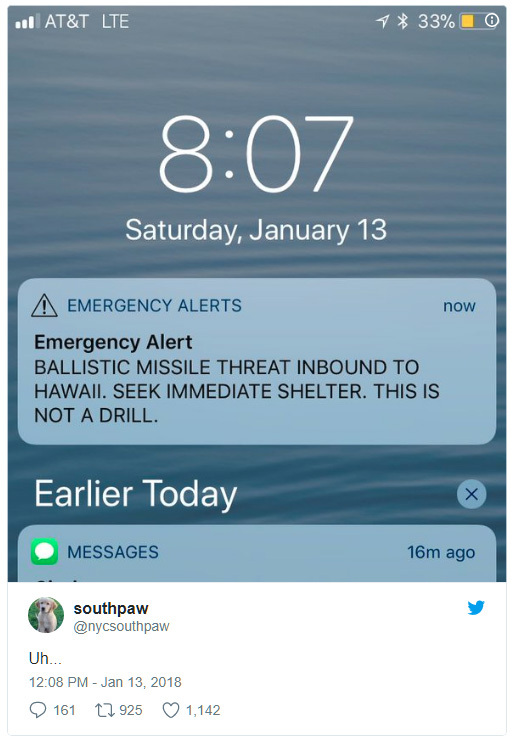 Multiple people reported receiving emergency alerts on their phones on Saturday reading: “BALLISTIC MISSILE THREAT INBOUND TO HAWAII. SEEK IMMEDIATE SHELTER. THIS IS NOT A DRILL.” Many shared screenshots of the alerts, all identical, on Twitter. The alert also seems to have appeared on television. Whenever these unexpected and potentially dangerous events happen, we the people are given an opportunity to take pause and to truly consider what kind of world we desire to live in. Up until this point, many of us have experienced poverty, starvation, illness, and manipulation by elitist interests. These, along with the typical violence that comes from these ills, must be dealt with if we are to live at higher states of prosperity and abundance. In order for us to move forward in a positive direction, it is necessary to not only evaluate our global or national situation, but to evaluate ourselves. When we are conscious of our own role in the changes taking place, we can then consciously direct our collective trajectory in a more positive route.